Doesn't look that bad. Approves. Only thing unexpected is the angle on the bottom of the back window. Mel, any internet link to the source of the photo? That's how Nova makes their LFS buses now. It is odd, but maybe it has something to do with engine location or that fin at the end. No link available. Taken by a friend at South Shops. This is the link to a article stating nova bus new rear engine door/compartment design. Anytime. You wouldn't see the number on the front. However (as I've mentioned a while ago), it still have the bar code tag indicating the bus number on the side of the bus by the front door. Wow the new look Novabus 7900 series loom great. They look streamlined and very modern. I can get use to the new buses. You can see a slight glimpse of the freedman seats. Looking through the side windows it looks like it doesn't have a rear window. Funny I can't think of another agency that has no rear window on a smart bus. One thing I seem to notice, the headlights are big, maybe a CTA spec? I could have swore it should have small headlights like the Pace Axess' All new models I thought have the small headlights. You can also see the glow of the LED interior lights. We can't see from the picture but I wonder if the jump seat behind the driver is dual like the CTA spec too, cause it seems like Nova would make that one longitudinal seat if the choice was theirs. BTW, now that I look at it, is the floor blue? It looks like it's the #5000 series spec. The glow in the dark floor? Not sure if one can make the comparisons from the pictures, but one thing that is fairly obvious is that there is some sort of clear shield over the headlight and turn signal. That may be distorting the perception of the size of the headlight. Update: The CTA lights don't look any different than in this NovaBus article on a bus delivered to RTC. One sees what one can see in a picture, but it sure looks like there is a reflection ahead of the headlights. I guess all of us will have to wait until it is on the street to make any firm conclusion about a lot of things. At least Mel answered your question about if an employee gave it to someone else to post. What a great looking bus hopefully I'll find out which garage they'll be out of before the system pick so I can go where they are lol. Yes BusHunter they do look like one of the amber signed 6400 series Novas at first glance. But if you look at the font in the signs, it's that which became standard in new CTA buses starting with the dreaded NABIs. It is a good looking bus. Of course CTA had to go with the more boring look of the windows on the exterior. Lol I'm actually glad they changed the windows to the cta look it blends better with the rest of the fleet. Meanwhile the 6400's are the last bus with the old cta logos on the sides of the bus. I liked the dot logo that stared with the then new 1000 series back in 06 but the old logos were classics and will be missed once the old Novas are completely retired. That's exactly my point. Enough with the blending in and doing the same exact same thing all the time. Step out of the box for once. If not for New Flyer discontinuing the LF, the 4300s wouldn't have had me looking at the artics in our fleet as more than just slow, cumbersome behemoths. 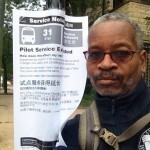 Maybe CTA should find another place to put the vehicle number [on the front of the bus]. It will be difficult to see when there are bikes in the rack. After about 1800 buses like that, you think they would have figured it out. Maybe the 4300s with the number on the black strip under the windshield are a little different. Well at least CTA would continue to have the Novas with the Thermo King Temperature/Climate Control System. Also, these Novas won't have the InSight seats. Busjack is indeed correct about the CitiPro seats will be installed on them.